Two styles, one inspiration: Maramures. Maramures is a wonderful region in Northern Romania where winters are rich in snow. Being a region surrounded by mountains, isolated and hard to access and conquer throughout history, the local culture is unique and has been preserved as centuries passed. Christmas traditions are very much alive in Maramures, not only in the villages, but in towns as well. Starting from the youngest child to the oldest person, everybody attends Christmas preparations. On Christmas Eve both children and adults sing carols, visiting all the houses in the village. The carol has acquired a specific purpose as a benefice form of magic marking the richness of the fields, the growth of animals, the marriage of young couples, influencing the lives of people and nature in a positive way. The carolers usually recieve a round pretzel (symbol of the sun), apples, (the fruit of knowledge) and nuts (associated with the World Egg). The holiday has three steps: first is the preparation time, the one where the people clean their houses, the yard and the graves. The second step is the Christmas Eve and the days after, until the last day of December, followed by the last stage which is the New Year, named also Little Christmas, and the Epiphany. Numerous winter holidays’ customs and superstitions have been preserved in the Maramures area, passed on from one generation to the next, stemming from ancient beliefs and myths. Thus, it is said that on Christmas one must wear a new clothing item, purchase a new household item, and greet the carol singers in a clean and bright home. Christian homes must not lack the Christmas Tree, richly decorated, as this is the pride of every Christian family. The Christmas tree is decorated on Christmas eve. In ancient times, the tree was adorned with apples, nuts and strings of white beans, as a symbol of the chastening of one’s soul. Wools and Wolf are making beautiful felt balls out of sheeps wool form Transilvania, the wool is used unbleached, bleached or dyed with plants and flowers. They come simple or decorated with traditional winter animals, hearts, Christmas tree, snow flakes. One other particularly charming custom that is still preserved in some villages in Maramures consists of the mask game. Besides the traditional games found in basically all the rural areas in Romania, such as the “ capra” (the goat costume dance) and the “ ursul” (the bear costume dance), in Maramures one can also witness “ jocul mosilor” (the old folks’ dance). Those dances have pagan roots. A similar carol is called Brondosii whereby men wear mask and bells and go through the village trying to ward evil spirits. Christmas and Easter are considered the most important religious holidays. Both holidays are about family, love and respect but, by far, Christmas is more attractive to children so, this period is eagerly awaited by them. 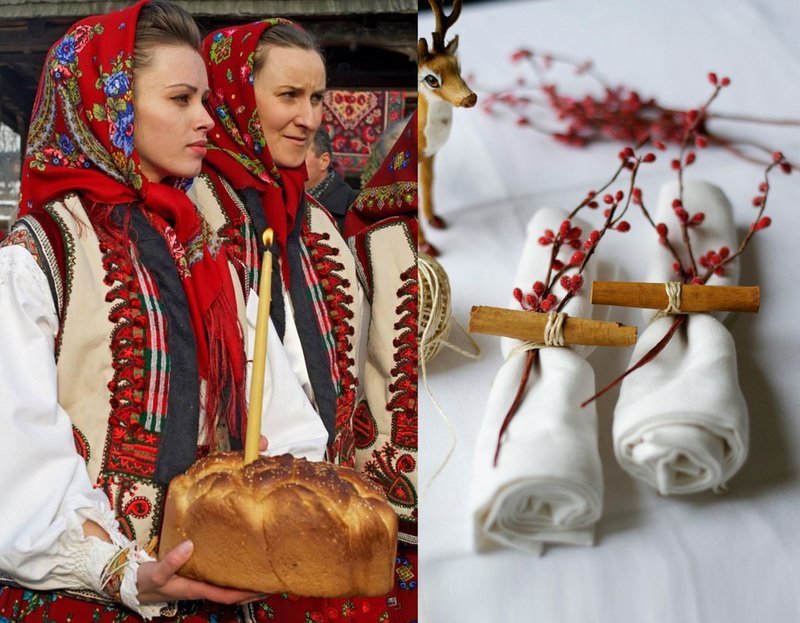 Yet, Romanian Christmas is not just about gifts, it is more about visiting friends and family, and rich meals. There is an entire laborious process in advance. Giving some extra attention to your table decoration doesn't mean you have to buy a lot of things. Once you have some fabric cloth napkins you can decorate every meal different just by using things you have in the house or in the garden: some fresh leaves, flowers, cinnamon, and a string to fix it around. Christmas ornaments don’t always have to be bold colored and shiny. Our first style, inspired by the traditions of Maramures, are translated by the use of rustic ornaments, natural materials, a neutral colour palette. The tradition of Christmas may be a big tree, richly decorated but it can be different: we can go for a needle-less tree: from the usual leafless branches, or leafless tree to creating a special corner with stars and letters, it can be the gifts wrapped in white paper, a simple garland with bells and tassel. Centuries-old traditions preserved in tiny villages. 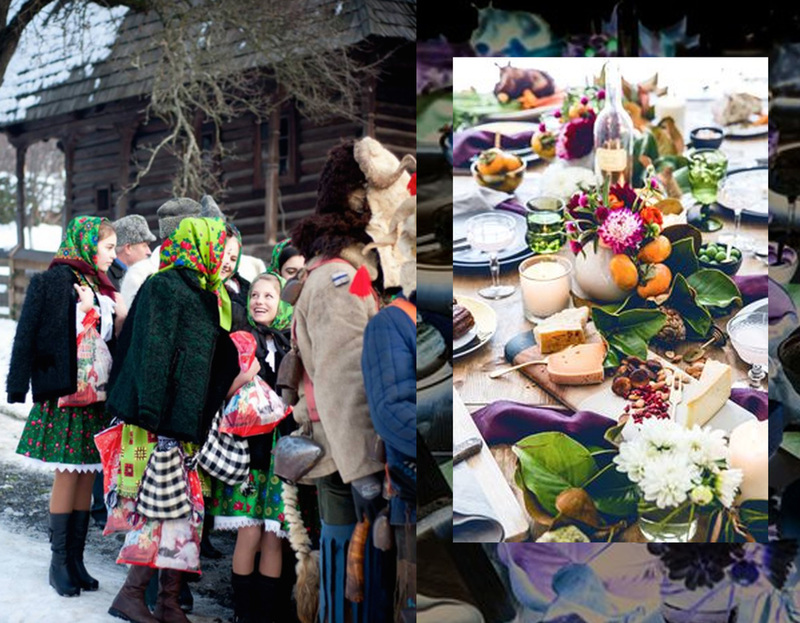 Maramures is Romania's region richest in tradition and Christmas here is like a fairytale. On Christmas day, villagers put on their colourful, hand-made traditional clothes and attend the Christmas mass. Maramures is famous for its wooden churches and many villages have one which is used for this occasion. The image of people wearing traditional clothes inside a wooden church is very powerful and brings you back in time centuries ago. It also tells a lot about the spirituality and deeper connection these people have with their heritage and nature. Traditional rugs are a great inspiration for colours, motives. The traditional flat woven rugs from the Maramures region look very modern through their use of bright joyful colours, and stylised flower motifs. A fresh and modern look for our second style, bold colours in combination with white. Paper garland, a cardboard Christmas tree, use of traditional motifs in a modern way, colourful lamps. Respecting traditional values, but inspired by the needs of the modern world. 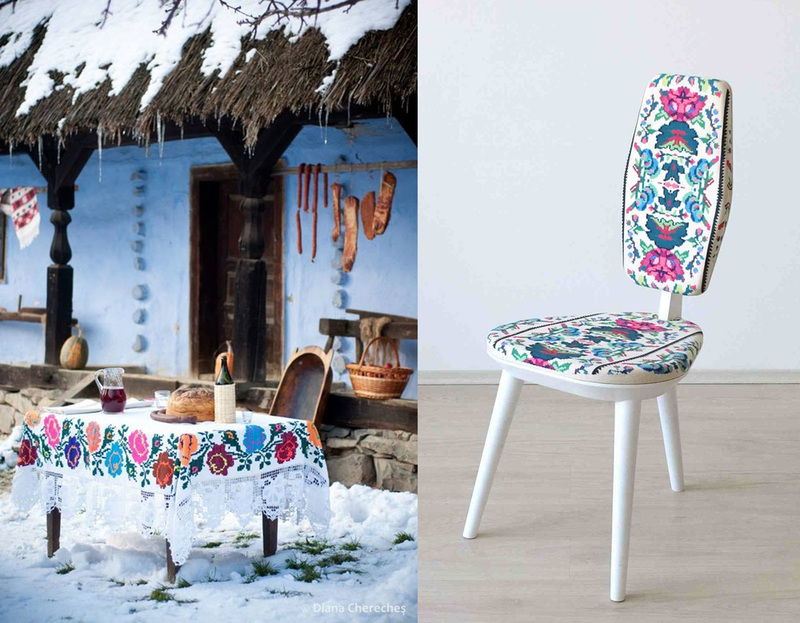 A great example is the Lana for Photoliu chair, an elaborately crafted piece with an authentic look, perfectly blended into today’s modern spaces, but still proudly displaying hints of its original timestamp, knowledge and ethnic base should not be forgotten but rather reintegrated with the help of modern design. On Christmas, in Maramures, the lights never go out and the carol singers walk from house to house. Combining decoration with light by using the Cuplo lamps, just open the zipper to let the light shine. The Christmas season is all about entertaining, following their tradition they will slaughter a pig a few days before. Many Romanians follow a 40 days lent, and eat afterwards for 3 days traditional dishes: pork chops, a sour vegetable soup, pork meatbals, sarmale which are cabbage leaves filled with grounded pork and served with polenta, and cozonac. Go for the mix-and-match approach to decorate the tabletop: use different dinner plates, two types of glasses, different sets of cloth napkins. Try a fresh garland in the middle, using leaves you cut in the garden, some nice flowers, even some fruits and vegetables and finish with some candles. Approaching Christmas we start thinking of buying gifts, don't forget the wrapping: even the most simple gift gets special by giving attention the the packaging. Beautiful paper, a special ribbon, a note attached, be creative. 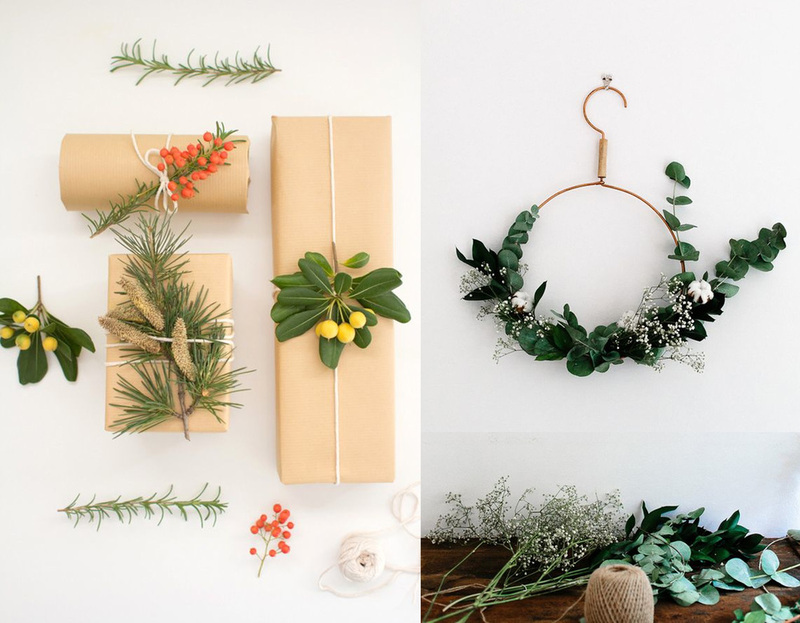 Even plain kraft paper looks special when it is dressed up with a few sprigs of berries or some green leaves. choose your colour palette: will it be neutral or colourful? Enjoy the cold and dark days: reading a book under a blanket, dreaming of a white Christmas.